[ #tfNews #MODO ]San Francisco, May 21, 2015 – Game developers, product designers, visual effects artists and media communication professionals can take on more challenging projects than ever before—both in size and scope—with MODO 901, the latest version of The Foundry’s 3D content creation solution. 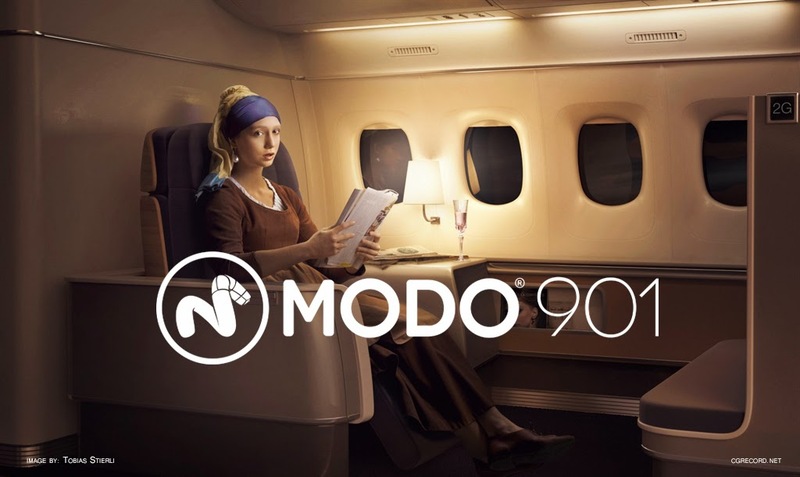 MODO 901 delivers innovative new features, accelerated performance and powerful enhancements to the core MODO toolset that let artists and designers working independently or as part of a team create high-quality, beautiful output in less time. The Foundry hosted a live event, powered by HP, NVIDIA and Digital Tutors, in San Francisco to showcase the impact of MODO 901 on the creative communities. Along with The Foundry experts, speakers included guests from industry-leading companies Wolverine, CoSA TV and PlayStudios. In addition, The Foundry demonstrated technology sharing and workflow improvements between MODO and MARI, its cutting-edge 3D paint tool, with a focus on the new advanced viewport now available in MODO 901. MODO 901 represents the most significant update so far. Earlier this spring, The Foundry provided a sneak peek of MODO 901, which includes the integration of the award-winning MeshFusion, new progressive texture baking, new and improved tools for everyday modeling tasks, better ways of working with both regular and UDIM multi-tiled UVs, and layered multi-resolution sculpting. "MODO 901 is a Juggernaut! MODO delivers for us, in a single package, what all the other competitors at twice the price cannot,” said Jonathan Josenhans, managing director, edelVIZ Architektur- und Produktvisuailsierung. “It models better, sets up easier, previews faster, renders more beautifully. No other package can compete with MODO as a holistic viz solution—you buy it, start working and everything is there. MODO just delivers, out of the box, without compromises." Powered by The Foundry’s Clear technology, 901’s new hardware-accelerated viewport lets users manipulate geometry and materials in a real-time setting that accurately displays lighting and shadows, BRDF materials, reflections, gloss, screen-space ambient occlusion, high-quality transparency, anti-aliasing, supersampling and a number of 2D post-processing effects. This allows people to iterate faster in a high-fidelity context that closely reflects the final render. 901 offers new support for Scalable Vector Graphics (SVG) files, along with a new Curve Fill polygon type. Artists can use SVG artwork in their MODO scene as texture files, or as curves, which they can then manipulate in 3D, or use as a framework to construct meshes. Edited vector compositions can also be exported back out as SVG files for use downstream in the design or manufacturing process. 901 accelerates workflows across the board—including selecting, displaying and deleting many items, or changing their type—even on incredibly large scenes. This includes faster animation of deforming meshes, with new support for the OpenSubdiv library, as well as new sampling techniques improve rendering performance with many direct lights and light linking. 901’s new dynamic and procedural effects include a new procedural Shatter item lets artists automatically shatter meshes based on collisions, while a procedural Rock item lets them add natural-looking landscape detail to theirs scenes. For rigid-body simulations, the ability to set up and control glue constraints is now much easier, while all dynamic simulations can now be saved and loaded as separate external cache files. 901 makes it easier to create cleaner, more flexible rigs for characters and other assets. New Command Regions lets users create clickable controls from any polygon selection and the controls only become visibly when mousing over the selected region, keeping the rig clean and unclutters. In addition, a new Tension texture lets artists drive values based on surface deformation. Critical for today’s workflow, 901 ensures integration across multiple applications. 901’s new TD SDK offers an easier and more intuitive interface to the existing Python API for writing plug-ins. 901 also brings Qt support to Mac OS X and Windows—already available on Linux—so TDs can make cross-platform custom UIs. And, with support for OpenVDB voxel datasets, and a projection shader that enables digital matte painting workflows with The Foundry’s NUKE, 901 plays well with other applications in the pipeline. 901 helps manage today’s complex assets more easily. The new Deferred Mesh item lets artists offload assets to disk, loading them only at render time; simple proxies or bounding-boxes represent the item in the scene with minimal memory impact. Other complexity management features include the ability to mass-convert scene image clips to Tiled EXRs, and better ways to expose only selected inputs in assemblies. 901 delivers faster, higher quality painting, with better blending, interpolation, stroke evaluation, subpixel sampling and brush orientation during drawing among the improvements leading to a superior overall experience. In addition, a new option in the Parametric Ink tool lets artists use surface parameters to vary the opacity of the applied paint, while a new texture switch node and wireframe shader extend texturing possibilities. 901 offers a new choice of BRDF material—GTR (Generalized-Trowbridge-Reitz)—that better matches specular highlights on real materials, and offers control over blurry reflections. The material is compatible with the new advanced viewport. In addition, MODO’s physically based Daylight model has been updated to provide a more realistic, physically accurate environment. 901 lets users store and recall 3D viewport settings as presets and includes a switcher bar for easily selecting favorite layouts. In addition, artists can now choose to display UV edge seams and boundary edges with different colors in the 3D viewport. These features represent a subset of the full MODO 901 release. A full list of features and benefits can be found here. With MODO 901, The Foundry introduces new pricing for new seats ($1,799), effective on May 27, when 901 becomes commercially available. Customers can still purchase 801 now (at current 801 prices) and automatically receive an upgrade to 901 when it becomes available. Current users on 701 or earlier can also upgrade to 801 now and automatically upgrade to 901 on shipment. This offer is valid until commercial release of MODO 901 on May 27, 2105.